Ah, sweet Jesus, at long last a gilt edge without any cussing, without any fighting, without any of it. I'm comfortable in my skin, I'm digging the egg glaire, and this, my friends, is a gilt edge. No doubt, the next 6 books will be cursed for my hubris. And speaking of Jesus, there's more good news. This weekend 43rd Parallel Press launched it's Etsy site. 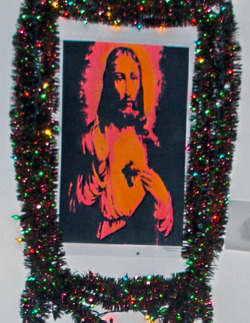 Now you can go and get your own black-light, day-glo and awesome-flocked poster of the Lord. Plus some stunning gig posters. A couple weeks go by while I'm slugging away at these edges; I'm not very happy with the results and I'm feeling like a lightweight. But I've had some great conversations with my colleagues and the good fortune to be re-introduced to the notes distributed by Peter Geraty (of Praxis Bookbindery) as he demonstrated edge gilding at the Guild of Book Workers Standards meeting a few years back. What I like most about Peter's approach, besides the voluminous practical information, is his insistence that over time, and with repetition and practice, you'll build you're own repertoire of materials and technique. I think this goes for everything we do. I'm grateful to all who are open with their knowledge of bookbinding, and hope over the years to be able to contribute in a like fashion. So here's egg glaire. My version is an egg white and an equal volume of water whisked together vigorously, and left to sit overnight. The settled mixture is dropped through layers of cheese cloth or a coffee filter to remove any offending matter. 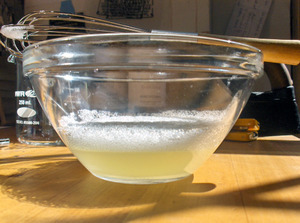 (6/19/08) A couple weeks back I was reminded by my friend Johnny at Quercus Press that we'd used 1/2 egg white + 1/2 vinegar to produce our glaire for Get Me the President. I gave it a try and results have been stunningly positive. I'm getting much cleaner and harder edges, plus it doesn't go foul. He claims to still have a quantity from that project that's still smelling fresh. Much obliged, Johnny! I'm also using this combination with the bole wash, and it's brushing up nicely. I'd been using wheat paste with bole as filler in the last go-round, but have been much happier mixing the bole with egg glaire---the color is more intense and the coverage more even. The bole/glaire is brushed on, then rubbed in with a ball of crumpled Japanese tissue (a la Mr. Geraty) from spine to fore-edge. 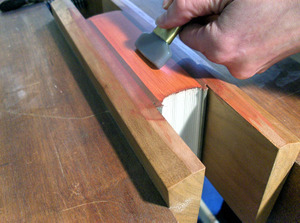 Another huge discovery over the last couple weeks was the use of a shoe brush to burnish the edge. I'd been referring to John Mitchell's book on Edge Decoration, where a passing reference was made to "brush burnishing". Peter Geraty again fleshes this out; it's a shoe brush, and after the initial coat of bole/glaire is laid down, and rubbed in with Japanese tissue, the surface is burnished with a shoe brush. 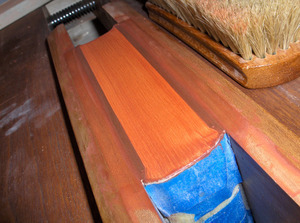 A second layer of bole/glaire is brushed on, allowed to dry thoroughly, the brush burnished til smooth. An agate burnisher is used, in multiple passes, to fuse the top edges of the pages together with the bole/glaire. I'm jumping ahead a little bit, but here's my first decent edge, warts and all. It got scraped off the next morning, but it was the first time in all this when the steps made sense, the edge had it's moments of reciprocating affection and I thought, "Aaah, I might actually pull this off someday." Sounds like some fancy school for teens. But no, it's just been my last couple days---and I'll get it out of the way right now: I did not succeed in creating a passable gilt edge. My first attempt was good-looking and shiny at one end of the edge, and kind of patchy with alot of egg-glaire spots at the other. I did, however, succeed in reacquainting myself with the whole process. It's been 8 years or so since Johnny Carrera and I gilt the edges for Get Me The President, and it really is not like falling off a bicycle. The learning curve is once again very steep and I will be repeating this set of steps at least 12 times for the project. By the end of it I hope to be a confident and competent edge gilder. I'll post these photos (and photos of the shiny, victorious edges) as an album to the left in the weeks to come. The text block is rounded (not backed!) and taped up in boards to protect the swell at the shoulder. I don't have a plough, but I do have access to a lovely guillotine (thanks Anna!). The edge is trimmed there-in. 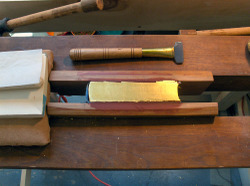 The gilding boards are prepped with a scraper to get the top edge flat and true. You can also use a blocking plane. This removes any ruts or bumps from previous edge work. 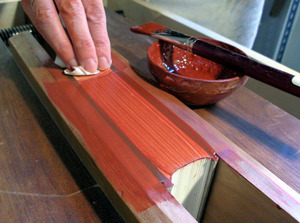 The text block, taped up in its boards, is first sprinkled with French chaulk and jogged up flush in the gilding boards. These are put in the larger press, which resides in a tub or trough (thanks Reuben!). The chaulk is there to fill any tiny gaps between the edges of the pages. The top edge of the book is sealed with a paste wash---which is wheat paste, pushed through a strainer, and watered down to the consistency of heavy cream. (6/19/08) Over the course of this project I've wound up using egg glaire to seal the surface of the edge. And for the egg glaire, I've switched from 1/2 egg white + 1/2 water, to 1/2 egg white + 1/2 vinegar. This holds true for the bole wash as well. I'm getting a much cleaner, harder edge. The brush I'm using is called a mop---it's made from some poor Russian squirrel's tail. It holds water and other liquid beautifully, and distributes it very evenly over the edge. Another paste wash follows, this time with color. Traditionally, and here, Armenian bole is used---it's a red earth pigment that gets ground up an put in to the paste wash. 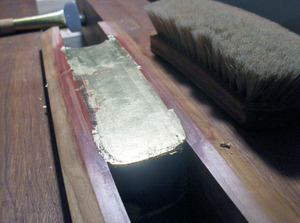 The bole wash provides another layer between the gold and the paper's edge (which alone would be too soft to hold the leaf). It also adds some warmth to the gold's color. You could put a graphite wash on there if you wanted a cool feel to your gold. And here's where I leave it. I'm too vain to throw up my first disaster, and this installment has already dragged on a bit. In the next go-round you can look forward to me nattering on about humidity, nose-breathing and how much oil is in my hair. The first and last points will be crucial!